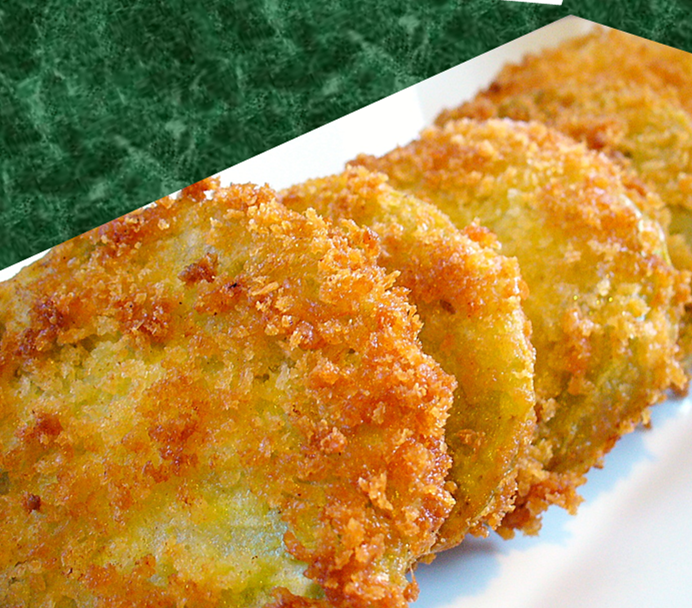 FRIED GREEN TOMATOES 5 DIFFERENT RECIPES | Cook, Party, Enjoy! We were coming home from the pool and we were all hungry…too hungry to consider going home and making something so Jessica said let’s go to Captain D’s. It is a seafood/fast food restaurant owned by the same owners as SHONEYS’ and I had heard it is pretty good so we decided to give it a try. Jessica and I ordered the Fried Shrimp Platter, baked potato and side salad and Andrew ordered fried clams, and Zachary ordered the children’s fried shrimp with macaroni and cheese and cole slaw. And oh yes the reason I am blogging this…I ordered the fried green tomatoes… 3 slices for $1.09. I came right home and pulled up my recipes to share with you all. Just like at the Whistle Stop Cafe! Slice tomatoes about 1/8” to 1/4″ thick slices. Place side by side on bar pan and sprinkle evenly with salt. Continue with slices layering them and salting them until all tomato slices are salted. Allow them to rest at room temperature or in the refrigerator for at least six (6) hours. This method causes the tomatoes to lose any excess water so that they won’t be soggy. If you have refrigerated the tomatoes allow them about 10 minutes at room temperature before you proceed. In a small bowl, mix flour, cornmeal, salt and lots of black pepper. Dredge tomato slices in mixture until well coated. Let them sit coated for at least 30 minutes while you prepare the skillet and oil. Heat canola oil in iron skillet over med high burner until very hot. Sprinkle crushed red pepper in hot canola oil and stir. If you like hot food, leave the crushed red pepper in the cooking oil while the tomatoes are being fried. If you do not like hot spicy food, remove the crushed red pepper after you have stirred it a couple of times. Gently place tomatoes in oil. (Reduce heat when necessary). Let tomatoes brown on one side, then turn and brown on the other. When tomatoes are a golden brown, remove one at a time and place on paper towels to drain. I’d say serve immediately, but they’re so good, most family members hover around the stove to eat them as they are ready. Delicious! Don’t forget some dipping sauces: ranch dressing and creamy Italian are good. These are cheesy with an Italian flair. In a large low side dish, combine cornmeal, cheese, and spices. Dredge tomato slices in flour, then egg, then cornmeal mixture, covering both sides completely. Place on baking sheet in single layer at least 20 minutes until ready to cook. Heat oil in heavy skillet over medium high heat reducing heat as necessary and fry 2 minutes on each side until lightly browned and crispy. Drain on paper towels before serving. In a shallow bowl, mix together the cornmeal, flour and sugar. Dredge both sides of the tomatoes in the mixture. Press the slices firmly into the meal so it will make a good coating. Put enough oil or shortening in an iron skillet to come to a depth of about 1/4″ and heat over medium high heat. Add the tomatoes to the hot oil a few at a time without crowding and fry about 2 minutes or until golden brown. Turn and cook the other sides. When both sides are golden brown, remove from the skillet, drain on paper towels and sprinkle with salt and pepper. Serve hot. Mix dry ingredients together. Melt butter and heat oil in skillet. Dip tomatoes in milk then roll in dry mixture. Fry on medium heat until tender and golden brown, 3 minutes on each side. Top with sour cream and sprinkle with dill. Combine black pepper, salt, cayenne pepper and garlic powder thoroughly; sprinkle evenly on both sides of each tomato slice, pressing seasoning in with hands and using it all. Let tomato slices sit at least 20 minutes. Combine flour and baking powder in a large dish with low sides. In a large heavy skillet, heat oil 1/2 inch deep over medium heat until hot. Just before frying, dredge each tomato slice thoroughly in the flour. Shake off excess and fry slices in a single layer in the hot oil until browned on both sides, about 5 minutes total. Drain on paper towels. Serve immediately. ← THE PIRATE SHIP SANDBOX CAME!! !